Well I know the gentleman who wrote that article. I would suggest you search out a lot more info. He does not tell you those fish in his pics are on a heavy feeding program. It is not so much that they die off in TN waters but they have to be on a heavy feeding program or they just don’t do well in our waters. I have several friends who have bass ponds and they stock copper nose for forage......copper nose breed like rabbits.....much more so than our northern strain of bluegill. They do not have their ponds on a feeding program.....plenty of copper nose in them just no size....that’s the way they want them. I’m sure you have heard of or maybe even watched Richard Gene the Fishing Machine on YouTube. He has a video of him fishing for copper nose in a large private lake......you can see automatic feeders all along the bank. But compare the size of the bluegill in his video to the size of the copper nose fishing reports on here from Led Hed. Lake Perris is a public lake...no feeding going on in there. The bluegill Sonny is catching are bigger than what is coming out of a fed private lake in Alabama. Copper nose love and obviously need the heat.....long growing season....they get that in California. As I mentioned in my post TWRA tried with a stocking in a 300 acre lake and it just did not pan out. I fish a 30 acre private lake that is full of copper nose. They have been in there for years. While there are plenty of them it is not common to catch 10-11 inch fish......lots of 7-8 inch fish. I wish it would work out for our waters but I just don’t see it ever happening. I currently work nights and I spend as much time as I can researching and reading up on the species I like, enjoy targeting. Hopefully that will pay off for me when I get to day shift, and have more time to get on the water. I find things like that very interesting. My $0.02, Carry on fish people! One of our western state parks has coppernose in it and they get about as big as any bluegill locally short of a few of our eastern spots that have them . We stocked them years ago in a pond and fed the you know what out of them and they never did get really really large for whatever reason . Red ear or copper nose ? I have never caught one there . Might be that I thought they were bluegill . I wrote the article in question, and it was written from a lot more experience with coppernose than the other people in this discussion have. I can take you to a four-acre pond that has nothing but coppernose and is not fed at all and they average a lot bigger, considering they're overpopulated in the pond, than northern-strain bluegill would under the same conditions - there are numbers of nine-inch coppernose in that pond. You couldn't make a pond in this state that was overpopulated with northern-strain bluegill have numbers of nine-inchers if your life depended on it. Regarding feeding, I don't feed any more heavily than thousands of pond owners across this state do that have bluegill - both coppernose and northern-strain - far smaller than what ponds that I manage for big bluegill produce. 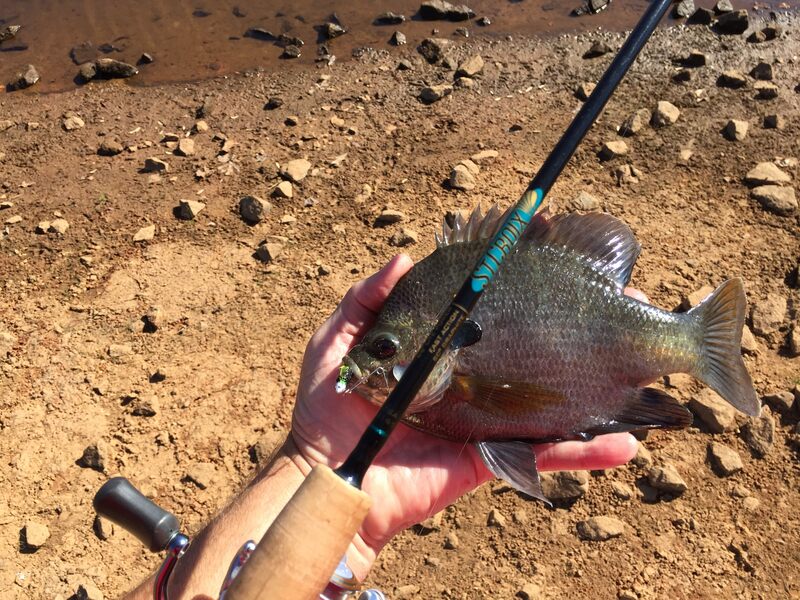 There's a lot more to growing big bluegill than just feeding them. I stocked coppernose in a one-acre pond in Indiana a couple years ago. I tried to talk the pond owner out of them, as I felt that was too far north for them to thrive; but he had a very specific reason for wanting to stock them. He had a neighbor who had stocked them a couple years prior and his coppernose were getting big. There is no fish anywhere that can't hack a particular climate, and then suddenly does great in that cilmate when fed supplementally; that's not how fish biology works. There are a couple terms applicable here: CT minima and CT maxima. These describe the minimum and maximum water temperatures, in Celsius, at which a particular species of fish begins exhibiting symptoms of physiological problems; and whether or not the fish is fed is not factored into this equation. There's a lot of misinformation - a lot - out there about coppernose and how they do with Tennessee winters. I'll give you two very specific examples about how "poorly" they do here. I was working with a one-acre pond, managing it for trophy bluegill; the biggest northern-strain bluegill that had been caught from it went about 1-1/4 pounds (the angler didn't weigh it). I stocked sixty coppernose in the 6-7" range in the pond, and two years later a 30.4-ounce and a 31.8-ounce coppernose were caught from the pond within twenty days of each other. Then a couple years later I was working with another pond about thirty miles away, this one about 1.25 acres; several northern-strain bluegill up to twenty-one ounces had been caught from it, but none larger, and I had all of the conditions in the pond maximized for trophy bluegill. So we stocked 100 coppernose between 7" and 10" in April of 2016. In five days this past May, a 12-inch coppernose that wasn't weighed and a 33.28-ounce coppernose were caught from that pond. I manage a half-acre pond that at its deepest point is maybe seven feet deep. In three hours of fishing this past May, two guide clients of mine, a husband and wife from Minnesota, caught six coppernose that averaged 27.68 ounces each; four of the fish were over 1.75 pounds apiece, and the largest one weighed 31.04 ounces. The fish are fed once a day for two seconds. A week or two ago I saw a photo on another forum of a pond owner who had stocked coppernose a few years ago in his pond in Kansas, just as a lark to see if they would survive. The biggest northern-strain bluegill he caught on the day in question barely measured eight inches; the coppernose measured just under nine inches. If you stock coppernose into a Tennessee pond that's improperly managed, or even a pond that's properly managed for big bass (such a pond will have many times more bluegill than one properly managed for big bluegill), they won't get any bigger than northern-strain bluegill would under the same circumstances. If conversely you stock them into a pond that's properly managed for trophy bluegill, and that pond continues to be properly managed for that goal, eventually you'll have two-pound bluegill. The public lake in question is Laurel Hill, and a one-time stocking of a few thousand fish is going to have minimal impact on a 300-acre lake. If they were stocked as purposefully as Florida-strain largemouth have been in many of our public waters, and the stockings were coupled with updates to the harvest regulations, a coppernose would eventually break the state record. One of the public lakes I fish have them in it . It’s a state run PFA at a WMA . I’ve only caught two of them . They do have two feeders on the lake . What kind of pellets are used to feed these fish so they grow fast? Considering getting some to put into a pond close to home to give them a boost this time of year. They need to have fishmeal as the primary ingredient; the other key is to have a high protein content, at least 40% and preferably higher. But feeding is only one piece of the puzzle. Huge Coppernose in neighborhood pond. I'm posting below a couple photos of coppernose that were stocked at 6" in a half-acre pond about ten miles from Columbia in spring 2014. These photos are from May 2015, one year after the coppernose were stocked. One measured 8" and the other two measured 9". This pond has never seen a pellet; it's also not fertilized. The pond is six feet deep at its deepest point. There's quite possibly a state record bluegill in that pond as we speak. I have seen splashes from bluegill in that pond that look like largemouth hitting the surface, but there are no largemouth in the pond, and no other fish large enough to make the splashes.